Knikole Taylor is an international professional development trainer, curriculum developer, speaker and author who has been privileged to travel the world to pour her learning into others. It is her firm belief that anyone can succeed with tailored support. Knikole works to assist educators in being their best for the students and teachers they serve each day. Knikole serves as the Instructional Technology Coordinator for a school district in Texas. In this role, she supports the growth and development of teachers and students through the seamless integration of innovative technology usage. Through personalized support, Mrs. Taylor works with teachers and teacher leaders to craft professional goals to extend their scope of instruction and meet the needs of all learners. 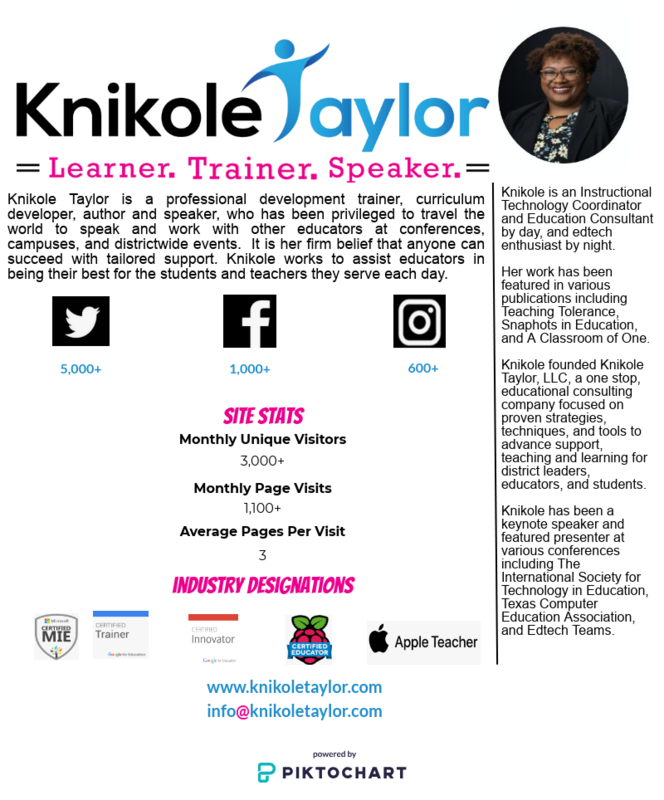 Knikole also holds many industry designations including Google Certified Trainer, Google Innovator, and Microsoft Innovative Educator Trainer. She received her bachelor's from Texas A&M-Commerce and her Masters of Education in Administration from Lamar University.